If you have a younger special Valentine in your life, that little one may not swoon over elaborate dinner you and your husband have in mind. But, he will jump for a Whopper! 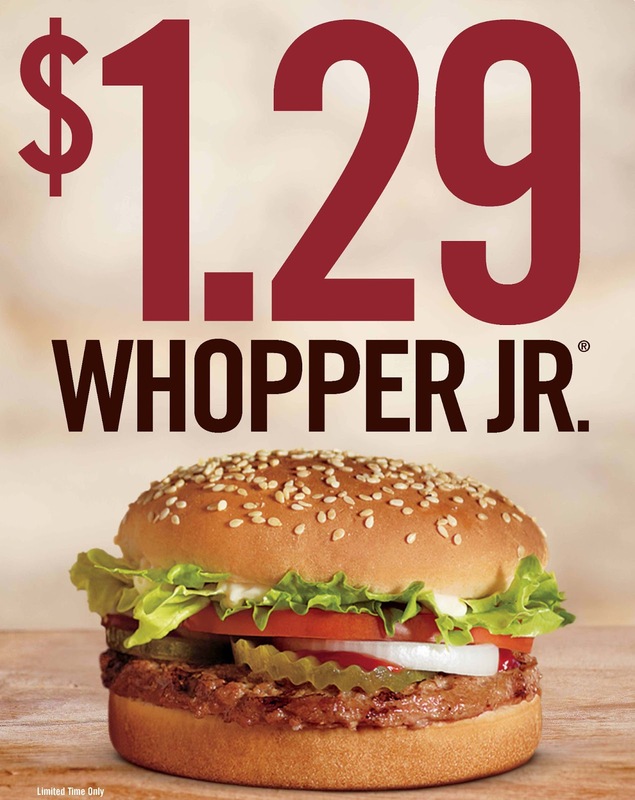 For a limited time, Burger King is offering the Whopper Jr for just $1.29. This sandwich will join the Value Menu favorites. What do you get on a Whopper Jr? Made with only high-quality ingredients like USDA Inspected fire-grilled ground beef, juicy tomatoes, fresh cut lettuce, mayonnaise, crunchy pickles, sliced white onions and ketchup all served on a toasted sesame seed bun, this special offer to enjoy WHOPPER JR. ® Sandwich for only $1.29. Don't miss this deal and discover why taste is king at Burger King. Wow. That is a cheap lunch. Thanks for sharing! That's a great deal! I know what I'm getting my 10 year old for Valentine's Day!